The book transitions through a selected set of procedural programming fundamentals to object-oriented fundamentals. This edition adds new language features and end-of-chapter GUI sections that include animation. 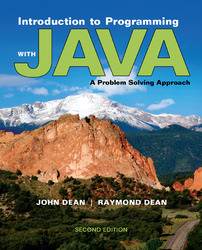 New chapters include an introduction to the Java Collections Framework and an in-depth treatment of recursion. Two new supplementary chapters on the book’s companion website describe the JavaFX GUI platform. To purchase an eBook version of this title visit www.coursesmart.com (ISBN 0077532740). With the CourseSmart e Textbook version of this title, students can save money, reduce their impact on the environment, and access powerful web tools for learning. Faculty can also review and compare the full text online without having to wait for a print desk copy.